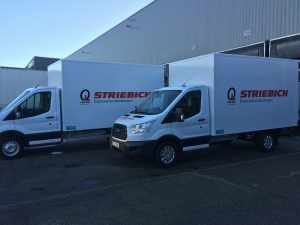 23.02.2017 – Expansion of the vehicle fleet - As of now two transporter with box body and tail lift complement the Striebich vehicle portfolio. Both wheelers will be running under the Striebich Express Service. Moreover the 3,5 t version is a great opportunity for our prospective professional drivers to become accustomed with the Striebich processes long before they receive their offical truck driving licence. The 4,7 t transporter with a net load of 2 t displays an even higher usage flexibility plus can be seen as another intermediate step for our apprentices. 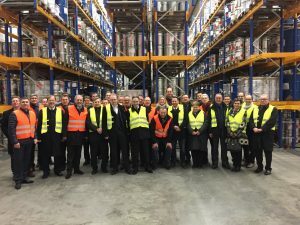 26.01.2017 – Visit from Graben-Neudorf - A field service conference presented a wonderful opportunity to become acquainted with the G+W field sales force in person. During the visit the advanced concept of the joint finished-product project was presented and live demonstrated. It was a delight to experience such a great interest and open discussing, which is likewise a testament of our close and cooperative partnership. 04.07.2016 – Team Striebich sends its sincere thanks to our member of the German parliament Kai Whittaker and his constituency district officer Dr. Alexander Stummvoll for their visitation in Muggensturm on 06.16.2016. Several topics on politics and economy where lively discussed during a frank and informative dialogue. Beyond that it was encouraging to see that even a family-owned mid-sized enterprize as ours receives such attention and deep interest. We genuinely hope that we could provide Mr. Whittaker an insight into the world of Logistics and wish him and his whole team a perpetually success in Berlin. 22.12.2015 – And cheese! 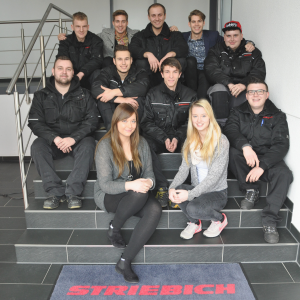 Towards the end of the year the current apprentices of Striebich present themselves together with the 4th generation of the Striebich family. Also in 2016 we plan to educate and foster further talent, hereto we offer apprenticeship places in areas such as commercial driver, professional in warehousing, management assistant for office management, management assistant for freight forwarding and logistics services, management assistant for IT or IT specialist. 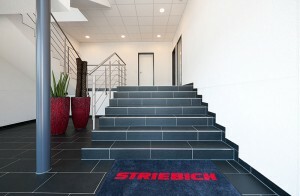 For more information please visit us under Striebich "Karriere". 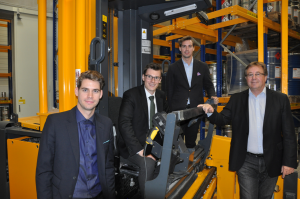 01.09.2015 – Logistics developed on your requirements. Within the scope of a recent outsourcing project, we in a process of building an advanced narrow aisle warehouse for hazardous goods. In cooperation with our close partner Freyler Industriebau GmbH, the miscellaneous warehouse for hazardous substances is emerging at our site in Muggensturm. Its design reflects the state of the art, of occupational health and occupational hygiene as well as other sound work-scientific knowledge relating to activities involving hazardous substances including their classification and labelling. You are invited to follow the stages of construction through our webcam by clicking on "Striebich Live". 13.05.2015 – We have been proud to welcome you at the transport logistic exhibition in Munich 2015. Thank you for your feedback, your suggestions as well as for the warm & intriguing conversations. We will take these insights and impressions for further motivation to foster high-performing services as your partner in logistics. 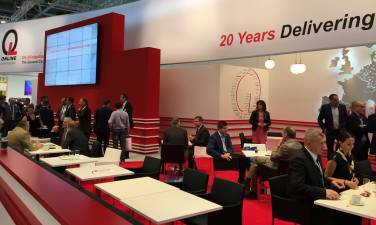 "20 years - delivering quality". 23.04.2015 – We are honoured for the opportunity to welcome you to our newly set up webpage. You will reach your well-known data entry tool through the button called "customer login".Besides, we are currently developing our own tool to announce shipments and value-added services the most comfortable way possible, which we hope to present you anytime soon. Until then, enjoy discovering our new webpage. Time critical services, a narrow network of international partners and intermodal transport empower you to foster a variable distribution of your products according your desired timeframe of delivery. Requirements of market supply will be targeted along your considerations of an optimal choice of service level. Empower your receiving area through pre-modified shipments according your production schedule. The applicable good - in require quantity - at your predetermined place - at the precise time of your demand - creates indispensable value to foster your flow of material within your enterprise in order to fulfill a high level of efficiency. Considerung your specific set-up times, Striebich picks, modifies, refines, assembles and packs your goods in suitable units for production. We care about the sourcing of your raw material and products. Reduce administrative overhead costs through buffered call-offs according to your plan of manufactoring. Gain time and resources for your core business benefiting from an upstream quality management in order to ensure a smooth production process. Minimize risks of invalid quantities, defected or false products. Maintain value of your investments. 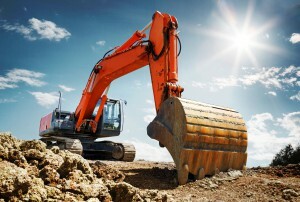 Reprocessing and the associated transports reduce costs of deprecation and endorse your striving after sustainibility. Our distinct aptitude for lean and streamlined processes leverage your opportunities to reduce complex order reprocessing. Handling of harzardous goods being regulated in "UN Recommendations on the Transport of Dangerous Goods" by the United Nations Organization (UNO) on part of transportation is supplemented by the Committee on Hazardous Substances (AGS) in "Technical Rules for Hazardous Substances" (TRGS) for storing above-mentioned goods. Substances in non-stationary containers are regulated in TRGS 510 which reflect the state of the art, the state of occupational health and occupational hygiene as well as other sound work-scientific knowledge relating to activities involving hazardous substances including their classification and labeling. Gain added value for your production and value-chain from an individually designed concept of cleaning your reusable packaging. Just-in time, just-in sequence, respectively along your demands, we offer our service to ensure a high-level of cleanliness within your value-chain. Detergents will be adjusted according its level of soiling and your conceivability of the required minimun level of particles. Saturating markets and market share linked to vigorous competition? Let us consult you about the opportunities of agile stock and shortest delivery times for your customers. Amplify your unique selling proposition (usp) by flexibility and a high level of supply capability. Our Warehouse Management System endorses manifold sale strategies, inventory models and facilitates highest quality standards in serving your customers. Safe packaging is the fundament of secure loading. Benefit from our assembling & packaging service. Emanating from your requirements we will develop a custom-made packiging solution and integrate it in a time-optimal distribution concept. Due to our cooperation with Beamer Group you will be in a postion to resort to a sophisticated stretch hood plant. In times of rising market demand - Are your striving to further advancement without its necessary time? Does administrative work and complexity consume valuable ressources and restrain you from implementing your strategic goals? Trust our know-how in the range of functional outsourcing and sharpen your core competencies. Utilise our international network of partners - cross-border goods flows with short times of delivery by shipments efficiently bundled. Daily departures to 19 european countries pave your way to act most flexible on international markets whether sourcing or distribution of your products.